While in Japan in July 2016 I visited the Seiko Epson factory in the Nagano region. 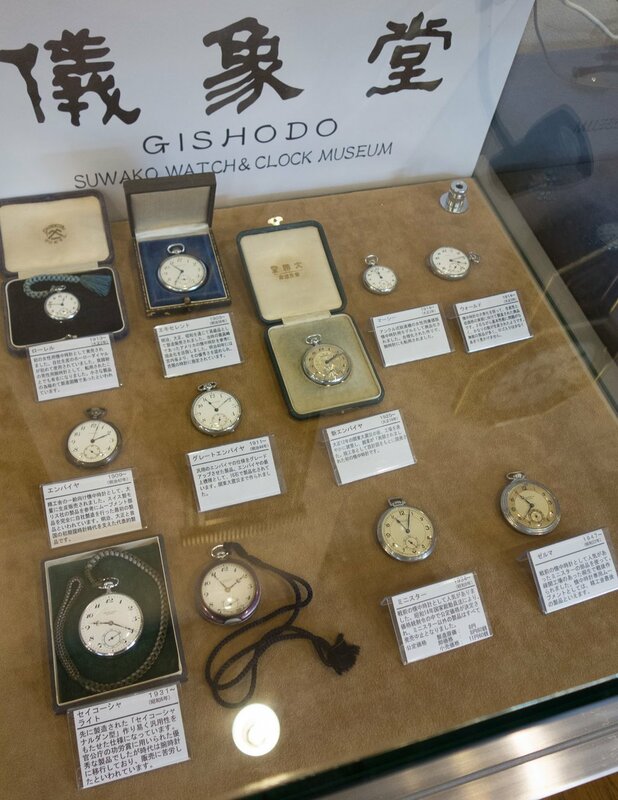 While there I also visited the Gishodo Suwako Watch and Clock Museum located in nearby Shimo-Suwa. Shimo-Suwa is a small town located on Lake Suwa just south of Shiojiri. To get there I took a local train from Matsumoto. As the Shimo-Suwa station is small the train conductor actually gets out of the train and checks his Seiko pocket watch before pressing a button on the platform signalling the train is departing. The Gishodo Suwako Museum is a few minutes’ walk from the station. 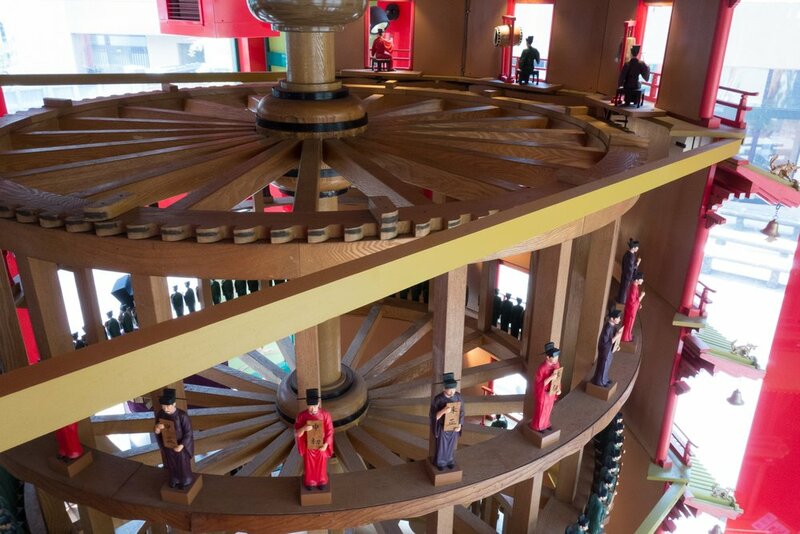 Once you arrive at the museum you can see the Suiun-Gishodai a large water driven astronomical clock that is a replica of a clock constructed in Kaifeng China in 1092. This clock is outside in the rear courtyard of the museum. The clock is powered by water that fills a bucket in on a wheel, as the weight of the full bucket reaches maximum it moves a lever and the wheel can advance one position. This clock moves a celestial globe that will track the positions of stars. Moving inside I headed upstairs to the main display exhibits. There are a series of wall clocks that line the hallway. 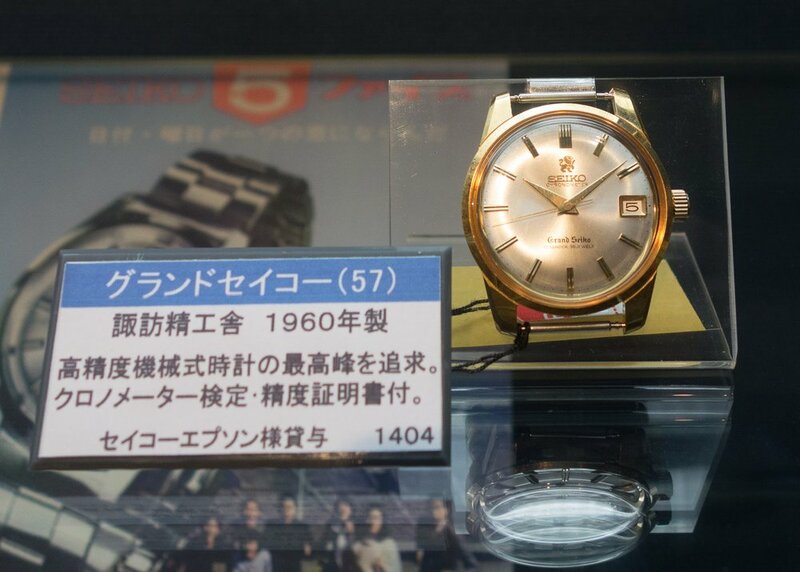 Most of these clocks are Seikosha models. 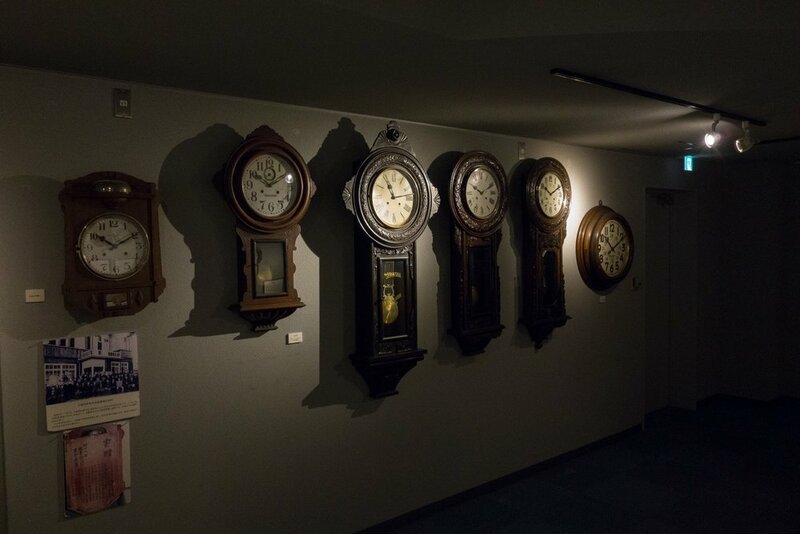 As you enter the exhibits there is a display of grandfather clocks and then a series of additional wall clocks. 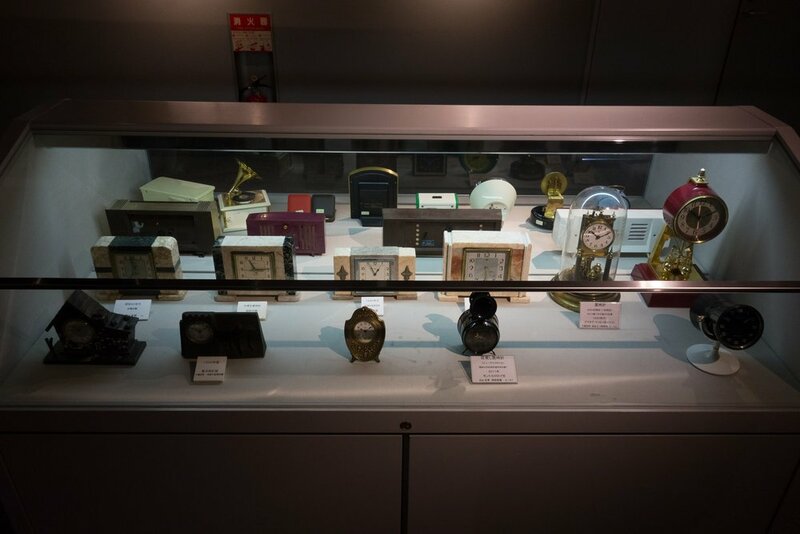 There is also a display of different table clocks.These are from different countries but there is an emphasis upon Japanese models. 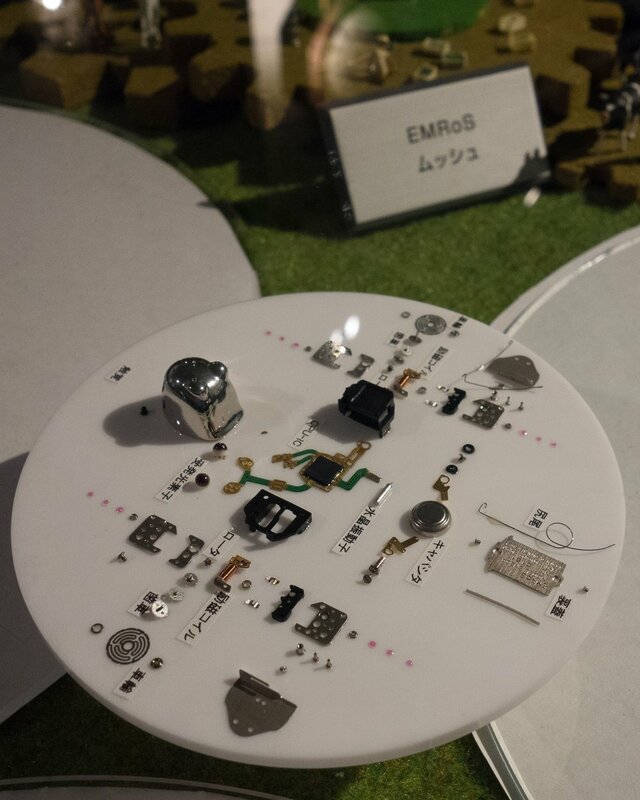 Next was a small display containing micro robots EMRoS (Epson Micro Robot System) first created in 1993. These were recognized by the Guinness World Records as being the world’s smallest robot. It is just 1cc in size and contains 100 individual parts. 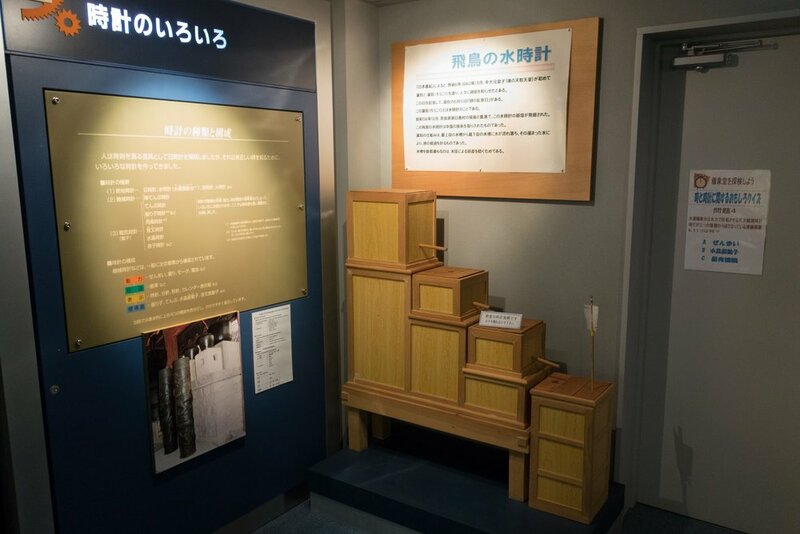 There is an example of another water clock that will raise a marked arrow as the water level rises. 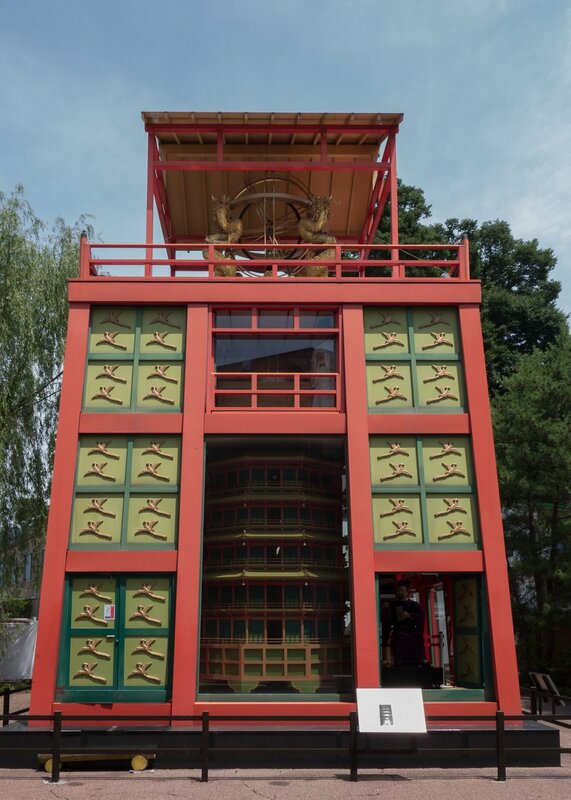 Next were some traditional Japanese clocks from the Edo period. After this there are a series of interactive exhibits. The first allows people to wind up and see the movement run. 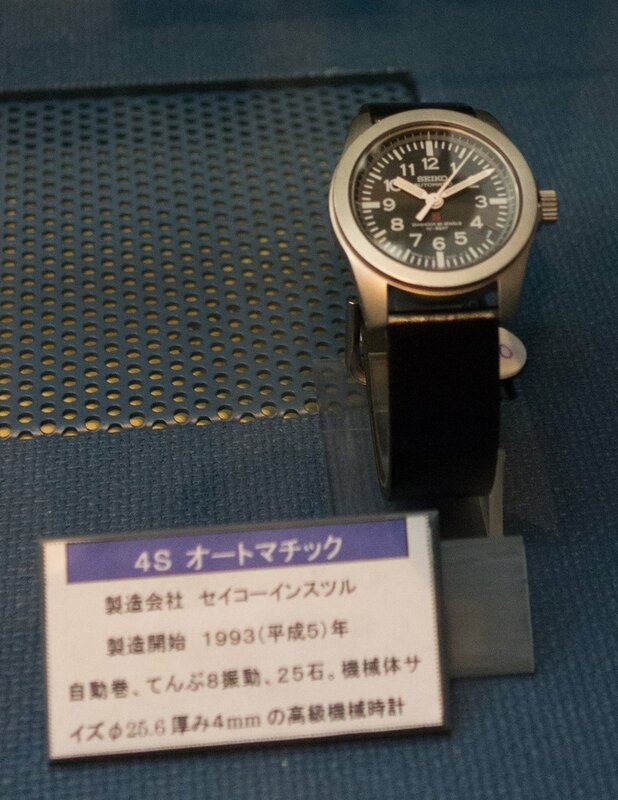 The next section has a large display showing how the Seiko magic lever system works. You can wind the handle either way and see how the winding mechanism works in both directions. Beside this are a pair of pendulums that allow you to place a series of weights on them and compare how this affects the speed as they move back and forth. 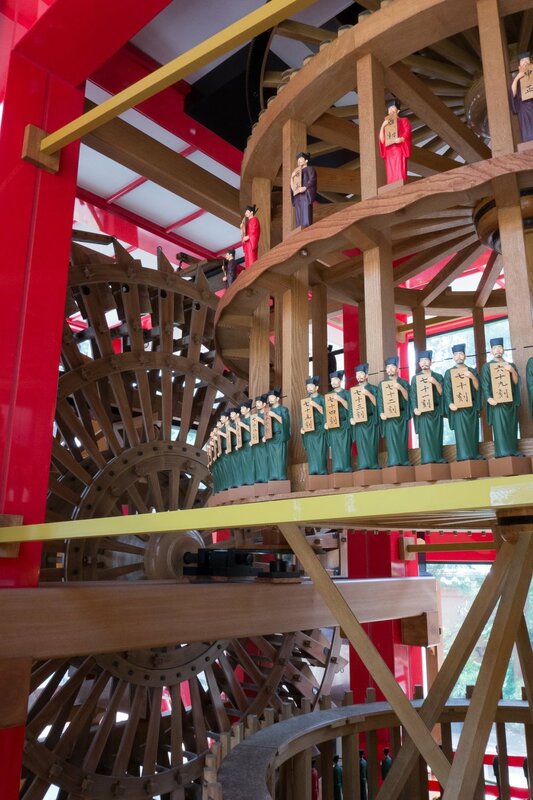 The following interactive exhibit allows you to wind a gear to move a weight to the top of a system that then moves a pendulum like the way that some large clocks operate. Beside this exhibit is a series of alarm clocks as well as a collection of pocket watches. Next is a cabinet with small pocket watches and then watches with their movements. The cabinet contains various models including a nice 57GS Grand Seiko Chronometer. There is a selection of models focused upon the 1964 Olympics. First is an advert for the Seiko Five Sportsmatic. Next is a very clean 5719 one button Crown Chronograph. There was an example of the watches that competed in the Swiss observatory chronometer trials in the late 60’s. The cabinet contained various other models but concluded with a 4S15 based SUS from the 90’s. Next was an interactive exhibit that showed how the power from a mainspring is transfer through the basic movement. 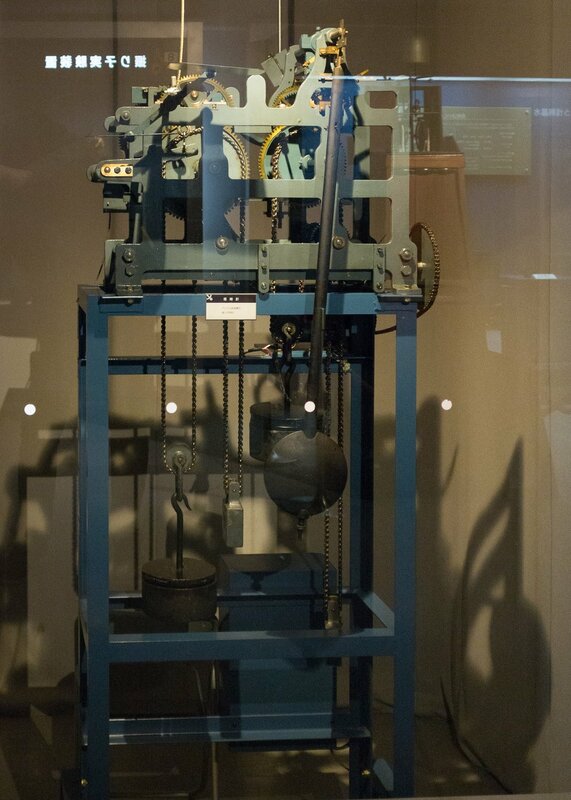 This was followed by a large balance wheel that allowed the spring to be adjusted showing how this speeds up or slows down the rotation. A large interactive day and date calendar system allows people to easily see how this mechanism works. Next is a tower clock that is installed and operating. 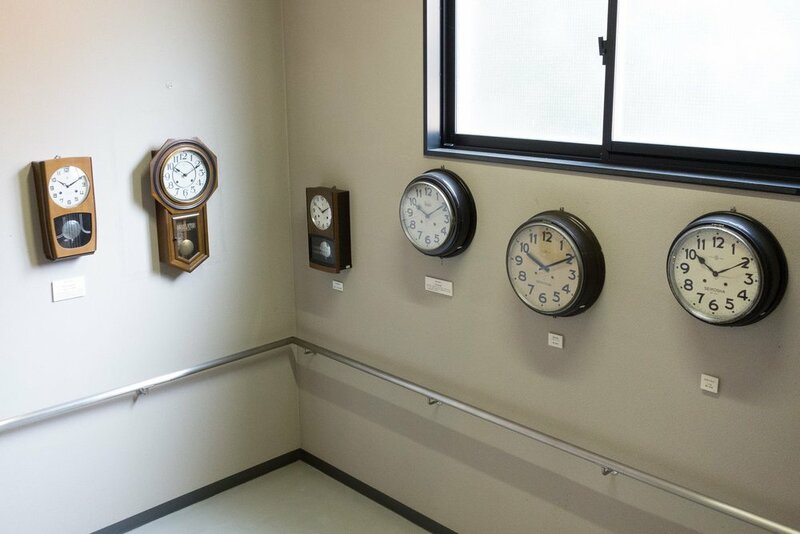 This clock was originally installed in the Seikosha factory in 1930 but was retired in 1995 before being moved to the Gishodo Museum. 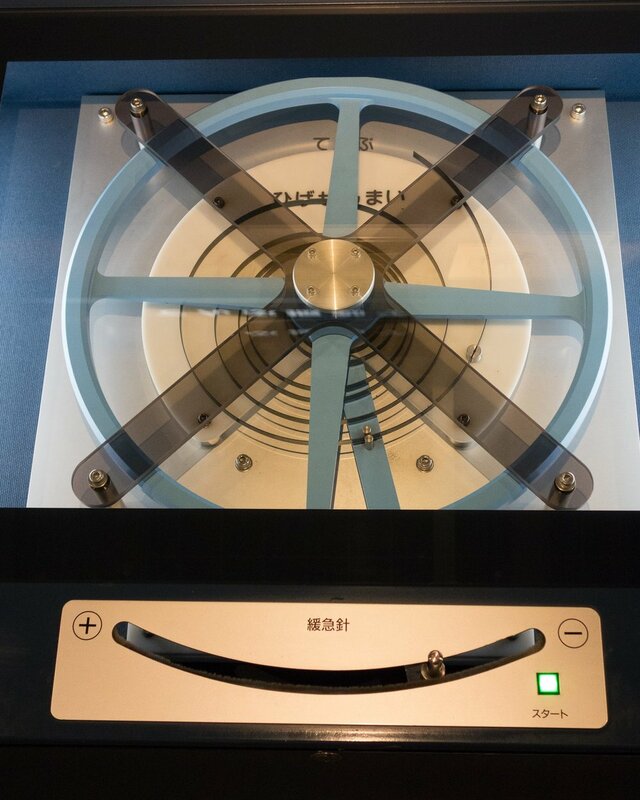 An interactive kinetic system allows users to spin a generator system and create a current to charge a energy storage device that will then power a quartz movement. 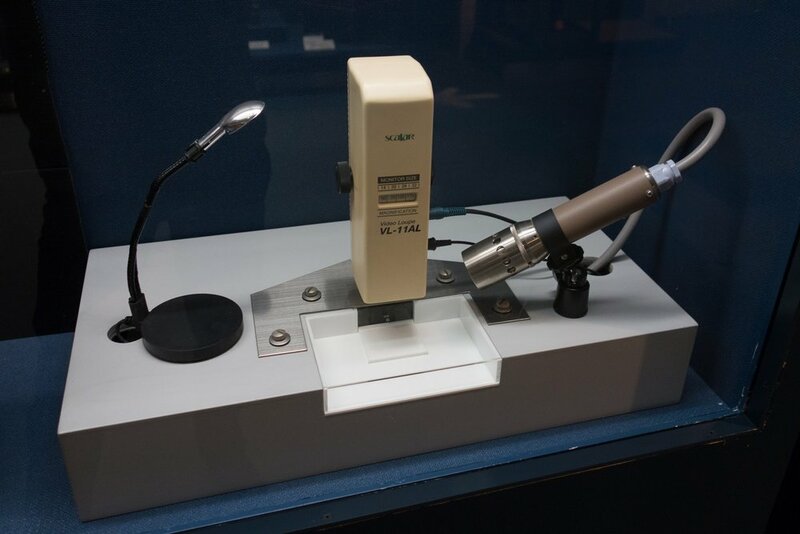 The next exhibit allowed the user to see a quartz oscillator move when a current was applied. There was also a pair of running crystal chronometers with one of them cut away to allow the movement to be seen. 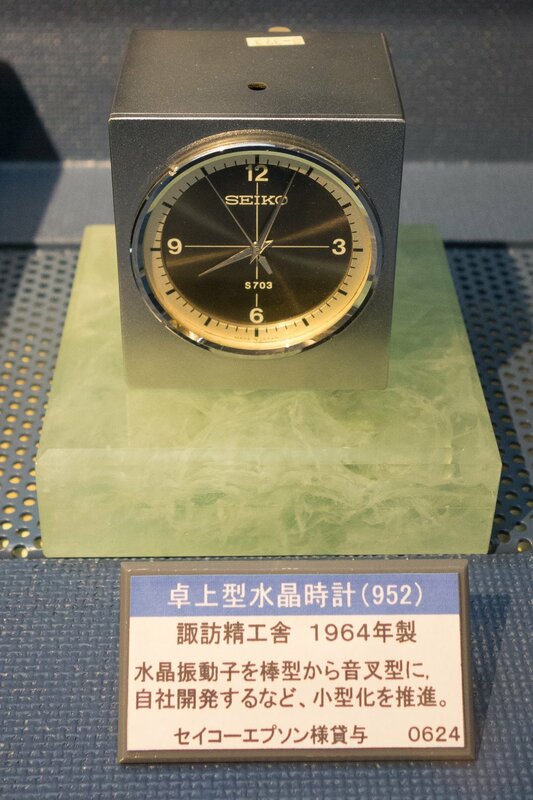 Next was a Seiko 952 quartz clock from 1964 that showed how Seiko was able to reduce the size of the oscillating crystal significantly over a short period of time. There was also a 06LC LCD watch from 1973. 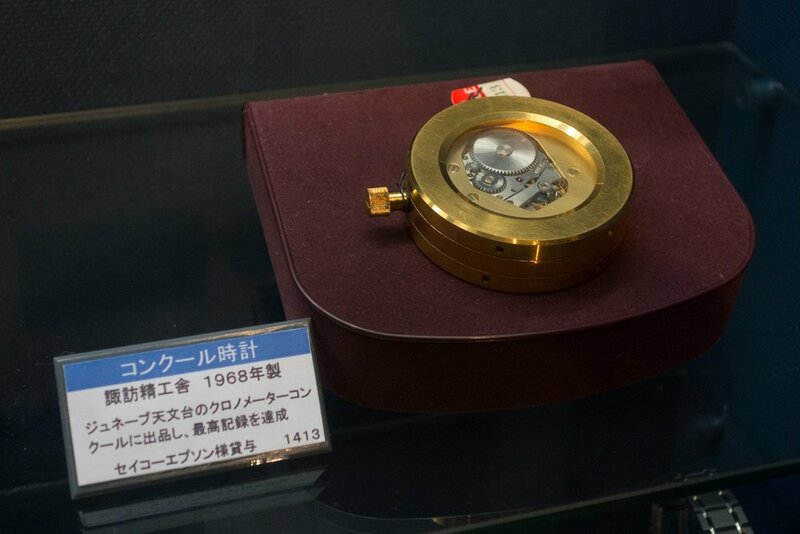 This was the world’s first watch with a six digit display. The next cabinet showed the progression of quartz models. This had examples of various models that advanced the technology. Next was a quartz 93 caliber from 1979 that was only 0.9mm thick and was the world’s thinnest at that time. 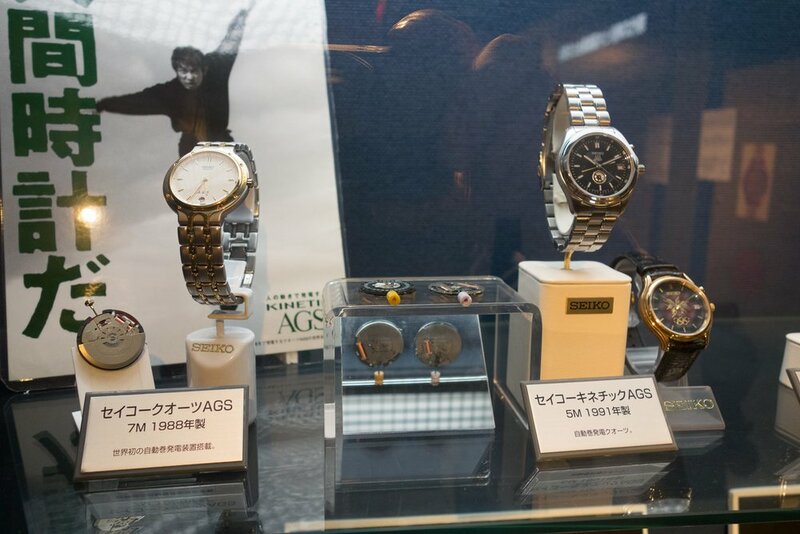 The models in the cabinet also included a 9F Grand Seiko example. There was also an example of the construction of the 7C46 golden tuna. Continuing the quartz models was the Seiko TV Watch from 1983. There was a cabinet with a mix of kinetic models, radio controlled models and the first spring drive movement. The AGS models with the 7M and 5M movements. The first Seiko radio controlled solar powered watch the M615 from 1996 and the first Spring Drive Movement from 1999. On the top floor of the museum is a workshop that allows visitors, both adults and children, to build their own watch. There are courses that are run at the museum and these are conducted by Seiko Epson staff members. These courses allow attendees to build their own clock, quartz or automatic watch and run from between 20 minutes and 6 hours. You would need to book in advance for these courses. 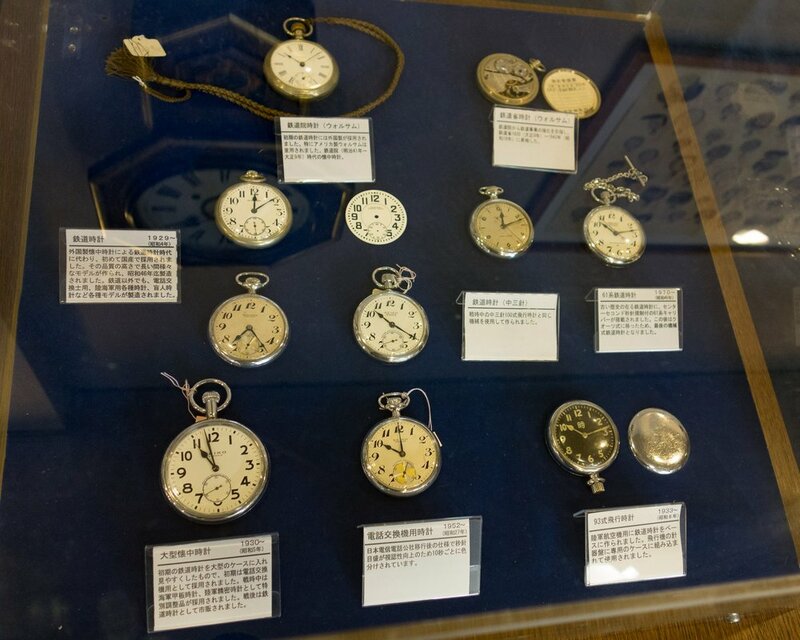 On the ground floor there was an exhibit featuring Japanese pocket watches. This exhibit contained both domestic and foreign pocket watches. There was a group of railroad watches and these included the Seiko that was the first domestic pocket watch approved for railway use in 1929. Also on display was a pocket watch with the seconds section broken down into 10 second sections. This design was to assist telephone operators’ time the callers for billing purposes. There was also a military piece that was based upon the railroad watches. These pieces were designed to fit into a special case in the aircraft instrument panel. There was also a Seiko promotional item that was given away at retail. This was a Prince lighter. There was also an example of the first Citizen watch model from 1924 and another early Japanese producer Muramatsu Clock Works based in Ginza in 1922. 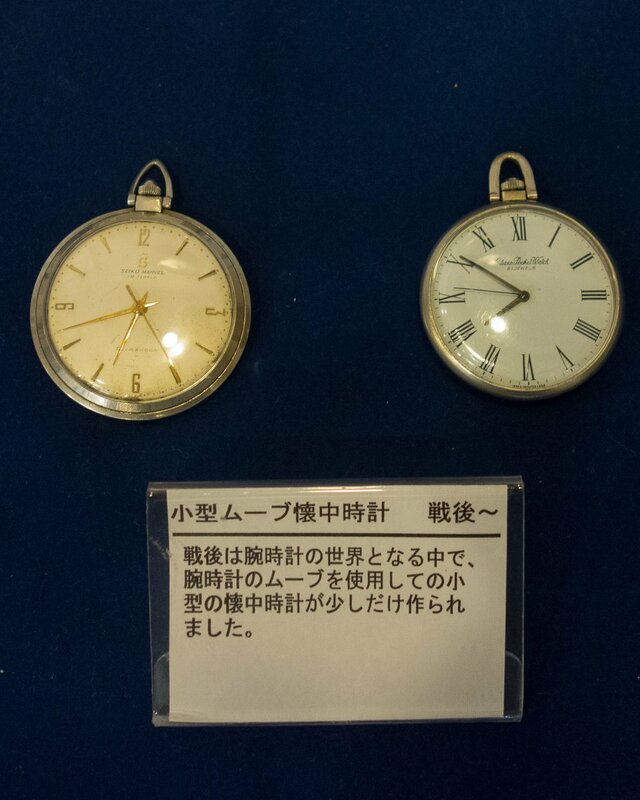 There was also a couple of examples of the smaller pocket watches that were released after the war, a Seiko Marvel and Citizen models were shown. The Gishodo Suwako Museum was quite surprising and had a lot to see. If you are ever in the region and are visiting the Seiko Epson Shiojiri factory or Epson HQ I would take the time to drop by Gishodo Suwako. The interactive exhibits are very well done and they have around 400 different watch and clock pieces on display.